“In the latest chapter of a hot dispute over the building of a proposed tower near the Brooklyn Bridge, the historian and Brooklyn Bridge expert David McCullough is voicing his opposition to the plan. “At a news conference on Wednesday, Mr. McCullough spoke to a crowd of more than 50 local advocates and politicians about why he opposed plans by the developer Two Trees Management to construct a tower called Dock Street Dumbo, so close to the Brooklyn Bridge. “While Mr. McCullough lives in Maine, he used to live near the bridge, and also spent extensive amounts of time near the site of the bridge when researching the Battle of Brooklyn for his book ‘1776′ and the bridge itself for ‘The Great Bridge: The Epic Story of the Building of the Brooklyn Bridge.’ He also worked with Ken Burns on a documentary of the Brooklyn Bridge. A letter from McCullough to Brooklyn Borough President Marty Markowitz opposing the Dock Street Project, penned in January, 2009, can be found here. 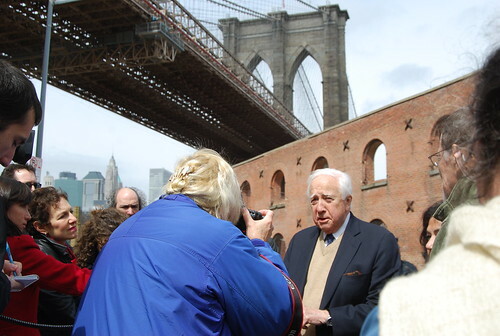 A video of McCullough calling for a halt to construction plans near the Brooklyn Bridge, which he says would obscure the monument and damage a forgotten historical site nearby, can be found here.